When I was studying at the university I was told about AI and chat bots as an example. Although the best way to start with AI is with a challenge, are chat bots still a good starting point to dive into AI? 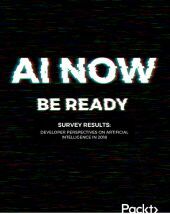 If not, what sort of project would a student start with to dive into AI? In addition, how versed in Python should I be to understand the examples in your book or to start programming for AI? If I'm an starter, your book is for me? There are a lot of different ways to define AI, but a working definition I have currently is to think of AI as enhanced automation. A good example is self-driving cars and/or semi-autonomous self-driving cars. It is quite useful to be able to turn on semi-autonomous driving in rush hour and have the car replace a stressful function for me. I would put chatbots in this category. They are a way of creating enhanced automation of a task that is tedious. A good place to start would be to use Amazon Lex + Amazon Comprehend, or Amazon Comprehend with Slack and AWS Step functions. I have some examples of these tools in the book. The first chapter of the book goes into a very brief tutorial in Python that should be enough to get non-experts going. Additionally, the style I use is to use simple parts of Python, mostly functions, vs reaching for the most complex language features. As a result, I think this book should be very readable and approachable by non-experts in Python. There is also an enhanced colab notebook based tutorial here, that might also be helpful for you in learning more about Python that I wrote: https://github.com/noahgift/functional_intro_to_python#safari-online-training--essential-machine-learning-and-exploratory-data-analysis-with-python-and-jupyter-notebook.